Chuck Arnold is one of the best. I have had my 96 F 250 Diesel in for maintenance and repair. Chuck is knowledgeable and one of the best at diagnosing intricate issues. I trusted him with my truck when he was at the Powershop, and have now followed him to Plateau. This is the only place that I will take my diesel for repair because I trust that they will do the job right. They are honest and dependable, which is a huge selling point in this day and age. I can't believe how thorough and professional PDP is. They are to diesel mechanics like rocket scientist are to rockets. TRUE professionals at their craft. My truck has never run better. I don't trust just any mechanic under the hood of my truck. These guys are the real deal. Being a long time friend from the Power Shop days, Chuck and the Crew are the best of the best. Their experience, knowledge, integrity are second to none. I recommend PDP to other diesel owners all the time. Being 63 years old and having a father who was a mechanic,i can usually detect the difference between those who know what they are doing and those who are unsure but say otherwise. From my first conversation with Chuck i was comfortable with his demeanor.It was obvious to me that he had a great deal of knowledge and he did not disappoint. My 2003 low mileage Dodge suffered from the usual factory fuel system anomalies and poor maintenance by the first owner and Chuck and his crew follow a logical progression of fixes and i kid you not,if they had blind folded me i would have swore they set me in a different truck.The clatter associated with a diesel was much less.The crank time is the same as my gas powered Colorado.The shudder on shut down was much less.The valve train was quieter.I spent 30yrs driving big rigs so i know how a good running diesel should sound. I was impressed with the service write ups,which included comment by the tech and highlights of previous work.And my truck has nice paint and chrome and they were careful with it. A business with this kind of integrity and ethic is getting harder and harder to find. THX Chuck & crew. Had my 5.9 worked on at Plateau and they are awesome! Chuck provided a spot on estimate and KNOWS his trucks! New clutch, upgrade front ball joints, free spin hubs and the workmanship was excellent down to the finishing touches. I'll go back in a heartbeat. This shop really impressed me. The service director Chuck was highly knowledgeable, trustworthy and experienced, and is/was the exact person I was looking for to do the job. I had an injector fail on my 2012 Cummins 6.7, and Plateau Diesel got the job done (6 new aftermarket BD Injectors) on time while maintaining great work and a high quality result. I drove down from Kirkland, and it was well worth the trip. Hourly shop rate is not aggressive, I felt they were very fair. No surprises. I recommend this shop to everyone on the west side of Washington. 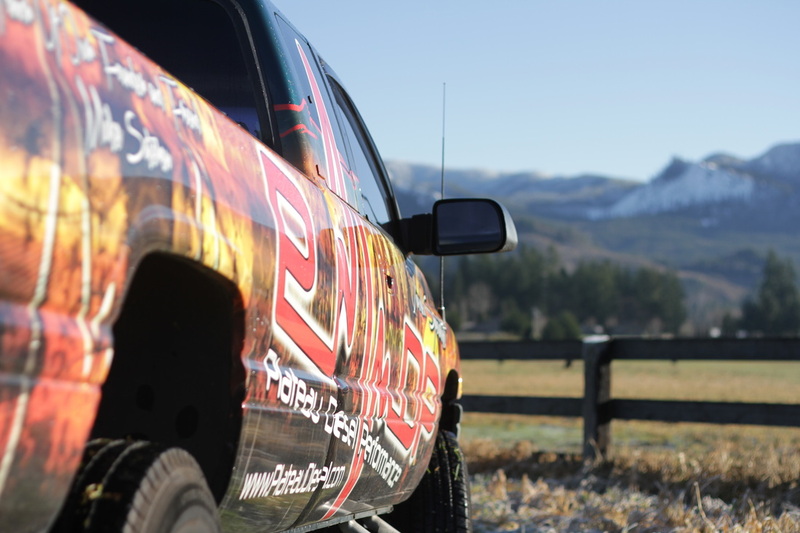 Truck is running fantastic, with better fuel economy than ever before! Late August, 2015 pulled ’96 Dodge and Carriage 5th Wheel into Ft. Stevens State Park on Oregon Coast. When parked in campsite, truck would not turn off with key and we quickly disconnected from trailer and went looking for Service shop in Warrenton OR to diagnose and fix. 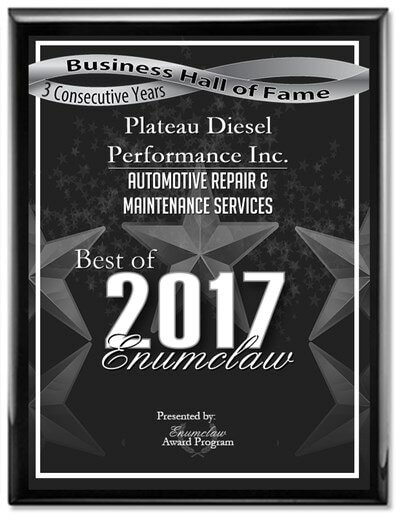 At our third shop to try I got smart and called Chuck Arnold at Plateau Diesel Performance In Enumclaw WA who has modified and maintained the Dodge since we moved to Pacific NW in 1999. He promptly got on my cell phone With the shop mechanic in Warrenton and guided him in shutting off the truck, diagnosing the problem, disassembly, repair, and re assembly To solve the throttle cable, fuel solenoid, injector pump linkage malfunction. Job was completed in less than 1 hour and we were on our way back to campsite with a reliable vehicle thanks to Chuck’s knowledge, teaching ability, and 15+ years of great help to us! It is really comforting to know someone like Chuck who can and will go the extra mile for his clients! First, I just want to thank Chuck and his crew for an outstanding professional job in repairing my '03 Excursion PS 6.0. I was about to have the engine replaced through the dealership and called Chuck for a second opinion. I will be eternally grateful that I did. It has turned out to be one of the smartest decision I've ever made. With Chuck's incredible depth of knowledge and the patience with which he shares that knowledge talked me off the ledge, earned my trust and he took the time to educate me on why and exactly how we would repair my current engine. He saved me money and in the long run I feel that because of the care taken, I have a much better quality product than had I gone with the Ford replacement. Chuck's team treats the whole system, not just the symptom(s). That thoroughness and dedication has earned my loyalty for life. No one else will ever touch my truck. Thank You! - Scott Cook, Auburn, WA. 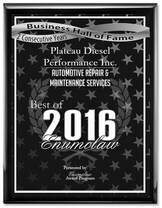 "I came to Plateau Diesel at the recommendation of my good friend Russ. He told me Chuck was a knowledgeable Diesel guy and good to work with. He was right on! I sure am glad I didn’t let the drive to Enumclaw from Gig Harbor stop me. The upgrade on the transmission so it would shift smoother, the stage I injectors and the FASS fuel pump certainly gave my 99 Dodge 2500 some extra power, made it more of a pleasure to drive and my mpg is on the rise. Chuck, Megan, Sam and the rest of the crew were great to work with. I’ll be back for some of the other recommended maintenance in the future and will recommend Plateau Diesel to my diesel friends." -Mike McCoy, Gig Harbor, WA. "Dodge Runs and Handles BEST EVER!! CHUCK & TEAM, Thanks for taking such good care of our truck, Susan, & I Wednesday thru Friday!!! This almost 20 year old truck ran and handled the best it ever has on the way home to Vancouver. Appreciate all your Team does for us. Good luck on your new company and if we can help in any way, let us know! It is truly a pleasure to be your client." 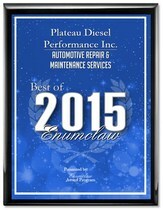 "You will not find more reliable or knowledgeable diesel techs anywhere. I have known and trusted Chuck and Megan for 15 years, and they are the Best!" "I followed the crew to Plateau Diesel Performance and just this morning had a simple issue with Ford Excursion and still got the best of service from Chuck and Sam. Honesty, Integrity and professionalism as always...best of luck with this new business, I am happy to be your customer!" "Thanks for fixing the "squeak" runs so much better now. I'll be recommending your shop to everyone. Back to enjoying the truck again. Awesome customer service, never get that with any other local shop I've been too."